One of the main culprits of downtime is when a cloud contact center software solution needs to upgrade. Just think about the number of times you have logged into iTunes or wanted to open an app on your phone, only to realize you had to shut everything down in order to get the latest version. This same upgrade process applies to cloud-based contact center software. Upgrades are essential because they keep your contact center software current and innovative, and meet the specific needs of clients. Unfortunately, most upgrades require your contact center to be down from anywhere between a few minutes to a few hours. Imagine how much valuable customer interaction time and productivity is wasted. 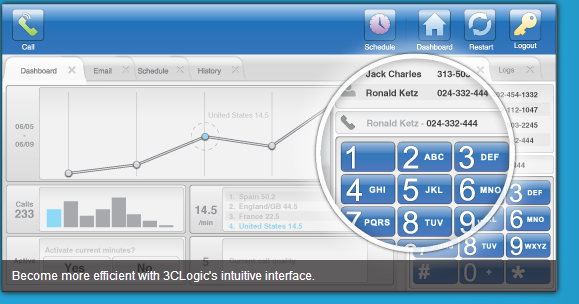 3CLogic’s new software upgrade solution, called Phoenix, allows 3CLogic Administrators and customers to upgrade specific call centers to newer versions of its software without updating other call centers that are on the same multi-tenant server. Using a GUI, Phoenix allows call centers to be updated by a predetermined date and time, set by the discretion of call center managers, with minimal to no downtime. If your contact center solution can offer software updates without interrupting operations, then this cutting-edge technology can place your contact center far ahead of the competition. To find out more about Phoenix or 3CLogic's cloud-based contact center software contact one of our team members at: 800 350 8656, or email me at drastatter@3clogic.com. Picture yourself on vacation. You decide to go to an amusement park, and there’s one big awesome rollercoaster that you absolutely have to ride before you leave for the day. You have to wait in line first. And the line is long, looping around itself like an anaconda in the middle of the amusement park. The amusement park attendants can load 12 people on each train and there are 3 train cars running at a time, but the entire line bottlenecks at the loading station. There aren’t separate lines for each of the train cars, so you have to wait in line for the chance to get into any of them. Now, I’m really about to ruin your vacation. Imagine that some guy in the front of the line has a heart attack. They have to stop the line for 30 minutes to get him safely into an ambulance before they can resume letting people on the ride. Some people have already left the line because they’re sick of waiting in the hot sun. They would rather ride something with a shorter line, but you want to ride this coaster; it’s the best one in the entire amusement park. This is how a centralized server works. All functions go through a single centralized server before they are sent out to service end points to be fulfilled. For contact centers, this means that all inbound requests come through a centralized server before they are sent to individual agents for processing, which takes up time. If the central server goes down, then all operations are put at a standstill until IT can fix the problem that caused the outage. Centralized server speed and functionality is eaten up if you want to back-up and store your data. The good news is that you no longer have to rely on a centralized server to host your contact center functions. An innovative grid-style architecture distributes the essential functions of a system across multiple nodes instead of being routed through a single point first. Think of grid computing as a fast-pass for your customers to get on all the rides without having to wait in a long line first. If one of these nodes fails for any reason, the functions are just routed through the remaining available components of the system. In a centralized server system, if the central server fails, then you are basically screwed. Grid computing enables a system to maintain functions even in the case of an emergency. It can easily be scaled up or down because the amount of end point nodes determines the division of the work load. You can even add additional nodes to provide extra support when the system experiences a spike in demand, or the nodes can remain idle until they need to be used for backup and data recovery. You can also take end point nodes out of the system if they are eating up unnecessary bandwidth and causing infrastructure costs during period of low demand. The entire point of having a cloud-based solution for your contact center is to maximize your service offerings while reaping in cost benefits. If you experience major downtimes with a hosted contact center solution, then you’re losing money from the lost opportunities and missed customer connections resulting from outages. Instead of dealing with the emotional rollercoaster of centralized server failure, think instead about a cloud-based solution that implements grid computing to ensure availability and reliable service. If you are taking credit card orders; or, if your customer service reps are exposed to your customers' credit card information, chances are you will have to take a real hard look at your contact center vendor and your processes to be Payment Card Industry Data Security Standard (PCI-DSS) compliant. Recordings: When your customers give their credit card information over the phone to your reps, chances are your contact center software is recording those calls. Now, if you happen to use a cloud based call center, these calls are recorded on some server in the cloud and the recordings are then stored in the cloud. How do you know if these recordings are secure in the cloud? What kind of security measures has your cloud vendor taken? Is your cloud vendor PCI compliant? There are a couple of ways to handle this. One way is to record the calls locally as close to the rep as possible and then never have those recordings leave your premise. In fact, what if you could record these calls with an encryption key locally on the rep's desktop, and then as soon as the calls is finished, the recording is transmitted to a secure server that is resident on your premise. This way, the recordings are never transmitted on any external network, they never reach the cloud, and you don't have to worry about your cloud provider being PCI compliant. Unfortunately, that approach may not be good enough to be PCI compliant if the requirements are that the call recording should be stopped as soon as the customer starts giving her credit card information. However, this can be accomplished by having the customer service repnavigate to a different tab within the contact center system user interface which would trigger a switch to stop recording the call, and as soon as the rep navigates away from the tab, the recording can start again. There could be environments where the requirement is that the sales reps or customer service reps should not be exposed to a customer's credit card information at all. In this case, the call can be transferred to an automated IVR and the the IVR interacts with the customer, takes the credit card information, and then transfers the customer back to the rep. This may not be the most efficient solution because while the customer is interacting with the automated IVR, the rep is twiddling their thumbs and hoping that the customer successfully gets transferred back to them when they are done entering the customer's credit card information. Instead of transferring the customer to an automated IVR, the contact center system should be able to do a three-party conference call among the rep, the customer, and the automated IVR. This way the rep is always on the call with the customer, holding their hand while the customer enters their credit card information using their phone's key pad. To make the above totally secure, it may be required that in the three party conference call among the rep, the customer, and the automated IVR, the contact center rep should not be able to hear the tones that are generated when the customer is entering their credit card information. The contact center software should be smart enough to suppress the DTMF tones so that the rep does not have access to these either. Remember, during the three party conference, the rep is talking to the customer and helping them finish the transaction without the fear of losing the customer towards the end of the transaction or having to worry about the customer being transferred back to them. What's more, all this has to be done by the contact center system that is running in the cloud if that's what you have subscribed to.